From The Hobbit: The Battle of the Five Armies comes the immense War Troll! Polystone statue sculpted to represent their likeness in the film! Limited release run of only 400 units worldwide! Revisit the word of orcs, elves, and hobbits with this War Troll Premium Statue! Based off the film The Hobbit: The Battle of the Five Armies, this stunning statue was designed, sculpted, and painted by artists who worked on the films. Standing about 20-inches tall, this incredible creature comes with a removable helm and a separate stand to set it on. 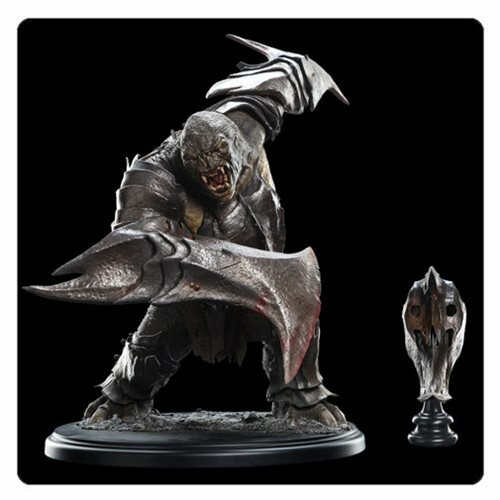 Customize your beast's look and take your collection to a new level with this The Hobbit: The Battle of the Five Armies War Troll Premium Statue! Made from polystone, this statue measures about 20-inches tall x 14 1/2-inches long. Alongside Orcs of all kinds and beyond count, the pale Gundabad Orc has brought Ogres, Wargs, and other fell creatures of war, united in bloodlust and a savage hatred for the united Elves, Lake-men and Dwarves. But mightiest of all Azog's beasts are the colossal Trolls; thick-limbed, leather-skinned Olog-hai with long tusks and a fiery hunger in their tiny eyes. With roughly beaten plate armor and sharpened blades strapped to their frames, these towering monsters wade through fields of their enemies, crushing and slicing foes like wheat in a harvest.